Oh, Frank Sinatra. There are few voices in music I enjoy more, few people who’s interpretation of a song I respect more. In short, there are few vocalists who I enjoy more. The legend of his connection to Jack Daniels whiskey, “the nectar of the gods,” is well documented and very, very cool. Long before Jack became the libation of choice for rock and rollers, it was three fingers and some rocks for the swingingest cat that ever put on a fedora to take a Las Vegas stage. My introduction to Frank came many years before my introduction to Jack, courtesy of a Christmas record (Christmas Songs by Frank Sinatra). A regular in my house at the holidays, I quickly found his versions of the holiday classics to be my favorites. As I got older, I purchased an anthology on CD (Sinatra Reprise: The Very Good Years) and it was official – I was a full on fan of Ol’ Blue Eyes. I started to get all of the albums I could – and believe me, there are a ton. My favorite era, though, has always stayed that 1955-1969 era, starting with In The Wee Small Hours, and ending with My Way. Songs For Swingin’ Lovers, Come Fly With Me, September of My Years and on and on, all of them brilliant. I discovered Jack along the way as well, and throughout my 20s, it remained my drink of choice. Smooth but punchy, a little bite but flavorful, good with Coke or straight, Jack Daniels was a staple of mine, at bar or home. Later, when they put out the even smother Gentleman Jack, it took over the coveted position as my favorite cocktail drink. As a fact I will detail in a longer post sometime in the future, it was my love of Jack Daniels that started me down the path of Bourbon, as a great friend noted my love of Jack and pointed me in the direction of Kentucky whiskey. The past few years, the team at Brown Forman (owners of the Jack Daniels brand) has introduced a number of specialty releases to their trademark product. They also embraced the relationship between Ol’ Blue Eyes and Old No. 7 and developed a marketing campaign around it including radio and television advertising. With this in mind came the Jack Daniels Sinatra Select special release – a unique, limited and (very) pricey tribute to the Chairman of the Board. I coveted a bottle, and at my birthday, received a wonderful gift from my wife and her family: a bottle of the treat. So how did it taste? First of all, I do not judge the value of a bourbon (or in this case – whiskey). If it is one thing I’ve learned in this crazy, often inflated market, it’s that value can only be determined by the individual. I don’t know that a bottle of anything is worth $1,500 to me, but plenty of folks clamor on Craigslist to grab a bottle of Pappy for just that. I am far more likely to point out a great deal or value than the opposite. 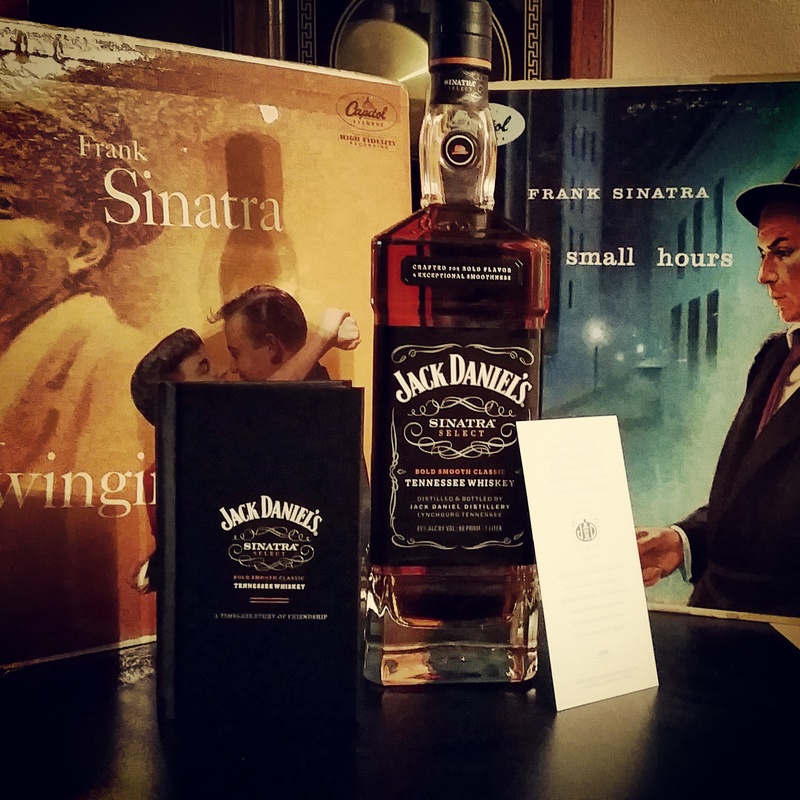 I bring that up, because the Jack Daniels Sinatra Select is very pricey.Around $175+ in stores, and far more online. Is it worth it? That is completely dependent on the collector. Personally, I’m glad to have it. Founded by Frank Sinatra, the Country Club was only for his closest friends. When Frank once arrived in England decked out in classic British style — gray flannel trousers and a dark blue blazer with a crest — the local media went into a tizzy to determine just what royal house the crest represented. It became clear upon closer examination the crest was crossed golf clubs and a bottle of Jack Daniel’s surrounded by the words: “Jack Daniel’s Country Club.” Frank had commissioned the patch for himself and a few close friends, and had them added to custom-made blazer. Also, the bottle is a one-liter size (instead of 750 mL), so there is more pour. The Sinatra Select is aged in casks that have had grooves put into the barrel staves. This allows for more alcohol to stay in contact with the wood itself (increases surface area). The nose shows this. Outside of being a sharper alcohol smell than the regular Jack (it’s 90 proof, as opposed to the typical 80), there is a thick wood, as well as smokiness and a hint of tobacco. Just like Frank would have liked it. The taste puts you on your heals a bit. It does not have they typical Jack smoothness. It is immediately husky, with that oak flavor prominent right from the start. There are touches of orange peel and molasses, but the wood and some accompanying black pepper take over quickly and remain well into the finish. The finish itself is on the short size, and smoother than the taste would have you anticipate. But the biggest item of note is that this whiskey tastes dry! Jack Daniels Sinatra Select has the tannins and dryness that would typically be associated with gin or red wine. It wasn’t unpleasant, but seemed like a negative aspect of the stave grooving. The drink is cool, just like it’s namesake. And it’s fun – and a fine collector piece. As a glass to have on the regular, you might want to grab some Gentleman Jack or regular Number 7.